System Definition Viewer is a new part of the MainTree uScript Toolkit. We are providing it free of charge as a service to the community. Using the SysDefDump uScript available below, you can create a XML file from your system and load it into the viewer. Once loaded, it will give you a complete view of all the DSTs, DCTs, Recode Tables, Reporting Units (in hierarchy or not), SAM codes, Fund Sources, and Program codes. 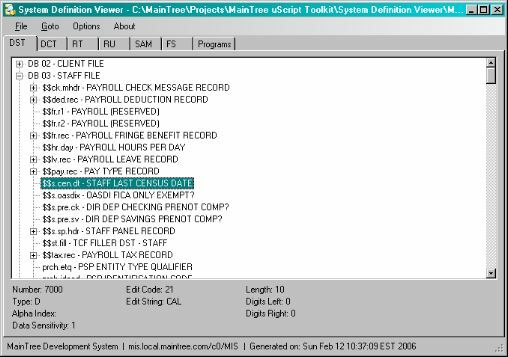 With a convent tabbed interface, System Definition Viewer gives you quick access to how your system is structured and how things link together. This is a great tool for system administrators or programmers who need to quickly find the name or number of DSTs, Recode Tables, SAMs, etc, or the contents of Recode Table or DCT.